People have been living in the Arctic for thousands of years. Today, the Arctic is home to a diversity of cultures, including more than 30 different indigenous peoples who speak dozens of languages and are concerned about the impact of climate change on their regions. Seven of the eight Arctic nations have indigenous populations – Iceland is the exception – and in most cases they have become minorities in their countries’ Arctic areas. Six organizations representing Arctic indigenous peoples have status as Permanent Participants at the Arctic Council, an intergovernmental forum that focuses on issues facing Arctic governments and their indigenous people. They are the Aleut International Association, the Arctic Athabaskan Council, Gwich’in Council International, the Inuit Circumpolar Council, Russian Association of Indigenous Peoples of the North, Siberia and Far East and the Saami Council. Many of these organizations represent members in several countries. For example, the Saami Council has member organizations in Finland, Russia, Norway and Sweden. The Aleut, who refer to themselves as Unangan, originally inhabited the Aleutian Islands in Alaska and Kamchatka region in Russia. At the time of first contact with Russian colonizers in 1741, there were approximately 25,000 Aleuts, but the population declined dramatically, and their traditional ways of life were disrupted. Today, about 2,200 Aleuts live in the Alaska territory, on the Aleutian Islands, the Pribilof Islands, and the Alaska Peninsula west of Stepovak Bay, and recent estimates suggest there are more than 15,000 people of Aleut descent. The Aleut have long relied on the resources of the Bering Sea, including fish, sea lions and seals, and many people still maintain a subsistence lifestyle that includes fishing and hunting. The Aleut International Association was created to address environmental and cultural matters affecting Aleuts on both sides of the Bering Sea, including contaminants, climate change and the impact of commercial fisheries on marine ecosystems in the region. The Arctic Athabaskan council represents 45,000 people living in the Arctic and sub-Arctic regions of Alaska, Yukon and the Northwest Territories, across vast areas of tundra, taiga and mountains. The population is young and growing. The ancestors of today’s Athabaskan people were semi-nomadic and hunted caribou, moose, beaver and rabbit as well as fish. Today, Athabaskan people hold on to many traditional practices and aspects of their diets. The woodland caribou herds spread out across the Arctic continue to have have important economic and cultural value, but these populations are in decline, primarily due to habitat loss from primarily due to mining, logging and oil and gas exploration. The Arctic Athabaskan Council is looking into how climate change threatens the way of life for Athabaskan peoples, and whether human rights law can influence national governments to reduce emissions of pollutants that drive climate change in the Arctic. The Gwich’in Council International represents approximately 9,000 Gwich’in living in the Northwest Territories, Yukon and Alaska. The council’s priorities include the environment, youth, culture and tradition, education, and social and economic development. The Gwich’in of northern Canada signed land-claim agreements with the federal and territorial governments in the early 1990s, allowing them to develop a self-government agreement, which is still under negotiation. The ancestors of today’s Gwich’in were nomadic and relied on the Porcupine caribou herd for food, tools and clothing, and many families still hunt, trap and fish. The Gwich’in are involved in protecting the Porcupine Caribou herd, which moves across the U.S.-Canada border. In Alaska, the Gwich’in are trying to protect the Alaska National Wildlife Refuge, where caribou come to birth their calves, from oil and gas development. The Inuit Circumpolar Council represents 160,000 Inuit living in the Arctic regions of Alaska, Canada, Greenland and Chukotka, Russia. It aims to encourage the development of policies that safeguard the Arctic environment, promote Inuit rights and interests internationally, and to participate in the political, economic and social development of the circumpolar regions. Within Canada, the Inuit Circumpolar Council includes four land-claims settlement regions: Inuvialuit, Nunatsiavut, Nunavik and Nunavut. In Alaska, the council represents the Inupiat (or Iñupiat), the St. Lawrence Island (Siberian) Yupik, and the Yup’ik and Cup’ik of southwestern Alaska. In Greenland, the Inuit make up almost 90 percent of the population. In 2008, Greenlanders voted for more autonomy from Denmark, leaving the Danish government in charge of only foreign affairs, defense and finances. The Inuit are long-established fishers and hunters. Their culture and livelihoods are tied to hunting beluga and bowhead whales, walrus, caribou and seal for food and other products, such as sealskin garments. The Saami people, also spelled Sámi or Sami, live in a region covering parts of northern Sweden, Norway, Finland and the Kola Peninsula of Russia that covers an area of approximately 388,000 square km (150,000 square miles). The Saami Council promotes Saami rights and interests, and helps develop policies that maintain the economic, social and cultural rights of the Saami. Traditionally, the Saami have relied on coastal fishing, fur trapping, sheep herding and semi-nomadic reindeer herding. The Russian Association of Indigenous Peoples of the North, Siberia and Far East (RAIPON) represents 41 indigenous peoples groups living in northern and Far Eastern regions of Russia and Siberia, numbering more than 270,000 people. RAIPON’s main goals are to protect the rights of indigenous peoples and to defend their legal interests. It also focuses on environmental, social, economic, cultural and educational issues faced by indigenous peoples in the Russian Federation. The relationships between indigenous groups and national governments vary considerably. Some populations have gained control over their lands – as well as rights to fishing, hunting and natural resources – but others have not. For example, the Inuit in Canada have claim over land areas such as Nunavut, and the Saami have parliaments in Norway, Finland and Sweden. But the indigenous peoples living Russia have come into conflict with the government and the oil and gas industry, which is interested in developing the same lands these peoples use for hunting, fishing and reindeer herding. For example, in November 2012, the Russian Ministry of Justice ordered the closure of RAIPON. It was not given permission to reopen until March 2013. 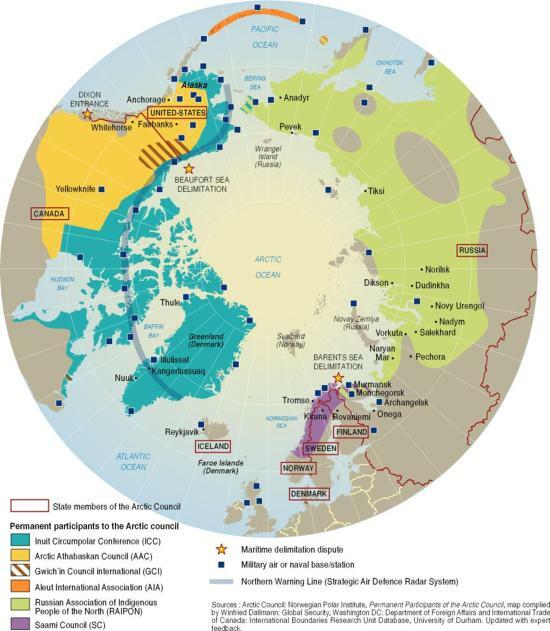 The recent political organization of Arctic indigenous peoples has led to the international recognition of human and political rights of indigenous populations, and brought attention to the economic, health and safety consequences of living in the north. Climate change and economic development could magnify Arctic pollution problems, increase insect- and wildlife-borne diseases and damage food and water systems. Arctic indigenous people are concerned about the impacts climate change will have on Arctic sea ice, permafrost and sea-level rise, and its effects on Arctic plants and animals and reindeer herding. For example, the risk of erosion is so great for some coastal settlements in Alaska that communities are voting in favor of relocating to more stable ground, but without funding these moves have been delayed. While the royalties that come from natural resource development are benefiting some Arctic communities, they sometimes come at a cost. Offshore drilling in Alaska posed a threat to subsistence whaling and hunting of seals and walrus. As the ice cap retreats in Greenland, it is opening up mining sites previously unaccessible, but this will bring tens of thousands of foreign workers to a country with a population of 56,000 that is largely indigenous. The rapid economic change may bring with it cultural changes and health problems, such as diabetes and heart disease. Indigenous leaders are also facing high rates of suicide and depression in their communities. Suicide rates have historically been low among indigenous peoples living in the circumpolar north. Today, they are among the highest in the world. Death by suicide among the Inuit in Nunavut, Canada, is roughly 10 times the national average. High rates are seen in other Arctic regions. Communities across the Arctic have launched programs to better understand the factors that contribute to suicide in their communities and to find ways to prevent it. For example, an outpatient clinic in Karasjok, Norway provides Saami youth with quick access to culturally appropriate psychiatric services without requiring a doctor’s referral, and a program in Nain, Nunatsiavut, teaches traditional hunting and fishing skills to high-risk youth.